Storytelling is a powerful thing. I remember a woman who came to our elementary school to tell stories. We all gathered on the floor in the library. She stood in front of us empty-handed. No book anywhere in sight. I was both a very literate and a very visual child, so it confounded me that this woman intended to tell us a story without reading it from a book. Where exactly was the story going to come from? And then she opened her mouth, and I forgot everything but the sound of her voice. Someone could have snapped her fingers in front of my face and I wouldn't have flinched. Adults had been reading aloud to me since probably the day I was born (thanks Mom and Dad! ), but I had never encountered anything like this—the storyteller's voice, the way it rose like thunder and then tapered away to silence, made me lean forward, my muscles tensed in physical anticipation of what was coming next. It wasn't just her expressiveness. There was something about the way the story came through her, as if it were electricity and she the conductor. She wasn't turning pages and parroting what a book told her to say. The story was inside her somewhere, and with only her voice, she conjured it before our eyes. As she spoke, I could picture that story more clearly than any illustrated book I'd ever read. 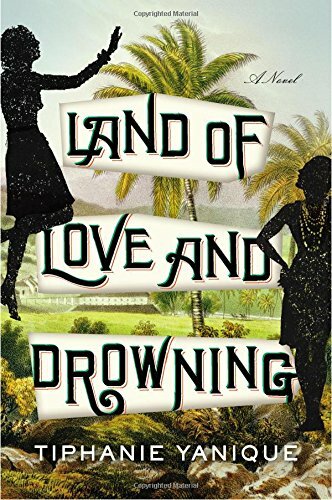 Reading Land of Love and Drowning reminds me of that experience from years ago. It feels like an oral history, the kind of story you'd be told before bedtime, in fragments, over many, many nights. It's a moderate 350 pages, but it reads slow like molasses, the generations of characters looping back on each other, making the same mistakes and suffering the same losses, often without knowing they walk a well-worn path. Something about the years passing in the lives of the characters makes me want to slow down and feel the weight of all that time. In 1917 the Bradshaws have just become Americans along with the rest of the inhabitants of the Virgin Islands, as the land is transferred from Danish control. Captain Bradshaw has spent his life on the sea, and it's the sea that claims him when his boat meets a reef. He leaves behind a tangled web of women: his wife Antoinette, his beautiful daughter Eeona, the baby Anette who is too young to remember him, and a mistress, Rebekah, who holds the power of dark magic but could never control his love. Through the years, these women's lives will overlap and intersect in strange and unsettling ways. Just like the storyteller that visited my school, Tiphanie Yanique transported me to another place and time with this book. I don't feel like I read it so much as breathed it in. Tags[Non-Icelandic] Sagas, Abandonment Issues, Baby Mama Drama, Choices With Far-Reaching Consequences, Complicated Sisterhood, Culture Clash, Dysfunctional Families, Escape From Your Present Reality, Hope You're Not Distracted By Dialect, Journey to the Past, Keeping Secrets, Long Leisurely Reads, Mamas and Papas, Multiple Narrators, Race Relations, You Think Your Childhood Was Screwed Up?